Thanks for all you do, Monette, to continue populating our great profession 🙂 It’s working!!! This study material consisted of information derived from years of personal experience and knowledge as a court reporter and combined medical and legal terminology, spelling, vocabulary and grammar, as well as reporting procedures. Monette has a strong desire to help the court reporting students succeed in their field. I believe her study material is a wonderful tool that should be utilized by students and court reporters everywhere as an aid in passing written knowledge tests. I have greatly appreciated the opportunity to fully review your fine book which is aimed at assisting students to pass the written knowledge test given in conjunction with the NCRA RPR and CSR state tests. We have ordered this book for use in our CSR prep course, which is given four times each year, for I feel it will be a great benefit to them. The format makes it readily workable, and the content is good. I have frequently stated that although students must have good speed and accuracy in machine writing, the knowledge factor is most important in an adequate court reporter. Enough has not been done along this line of student development; and your book certainly will contribute greatly to producing a well-rounded graduate. I have had a long history in training captioners, and it is my belief that the strongest captioners are those who are strong writers. Seems simplistic, I know, but the reason that they are strong writers is not because they have got perfect fingers on perfect hands. The reason that they are strong writers is because they can process information at a very rapid pace. And they can process information quickly because they know what they are writing. You can not write well what you do not know and what you do not understand. In the end, it is all about words, but you have got to know the words and the subjects. Toward that end, I want to recommend to any newbies out there that the materials that you are using to prepare to caption are equally important as the actual writing skills. One product that I would highly recommend is the CATapult CD Series. Monette Benoit has a long and illustrious career in developing materials that give captioners and captioner-wannabes the knowledge that they need to caption well. The CD Series includes a realtime dictionary builder that is compatible with any CAT system, and it even allows you to import your own lists or lists that are shared on this forum and others. Working and playing with your CRRT CD, Court Reporter Reference Tutorial, CD prep for the CSR, RPR, RMR written knowledge exam, WKT, your Court Reporter Reference Tutorial CRRT CD, is like being on Who Wants To Be A Millionaire. I LOVE IT!! If you were on the show, you would want to weigh each answer carefully, selecting the right one because all that money is at stake. The WKT, written knowledge test, study material is AMAZING. You have given so many court reporting students such a great advantage, and I’m going to tell every one of my court reporting friends and classmates how awesome your books are. With Monette Benoit and Bob McCormick’s CATapult CD programs, you make entries in your dictionary WHILE YOU ARE DOING REALTIME — an important distinction, because you then immediately see if you are creating conflicts with other entries in your dictionary. Instead I melted, as usual whenever someone asks, “Marty, can you do …” and so here I am, an old soldier pressed into what is certainly not the most unpleasant duty. After all, in VITAC operations, with their pages dog-eared from never ending use, are Monette Benoit’s wonderful reference manuals on sports, the environment, the military, politics, ethics, religion, and virtually everything else under the sun, is perhaps the greatest collection of educational and reference material ever assembled by one individual in the court reporting industry. If the real-time writers of the world can benefit from Monette’s contribution, surely I have an obligation to honor her contribution. The “NCRA Test Prep Workbook” is a remarkably versatile tool. In this age when the raw material of the average high school educated student gives teachers such poor clay from which to mold future reporters, here is a wonderful tutoring tool, which can be utilized to make up for the years of educational neglect. Combined with the “Companion Study Guide for Reporters and Students,” “The Court Reporter Reference Textbook,” the workbook simultaneously serves as a valuable vocabulary builder and imparter of critical knowledge to help the average contemporary student achieve excellence. For those about the face the daunting challenge of the NCRA Written Knowledge Test, National Court Reporters Association WKT, the workbook offers a full review of the potential battery of questions they will be facing. I have always felt (and I know I’m far from alone in this opinion) that the best reporters, those that have shown the most remarkable of reporting skills, are those with the broadest knowledge, people of great intellect who have refined their mental and shorthand capabilities to the farthest degree. We were once a very scholarly profession, even though the practitioners did not always possess advanced degrees form universities. Where but in reporting can one find women and men knowledgeable in such diverse areas of our mother tongue as medical, legal, technical and general language? 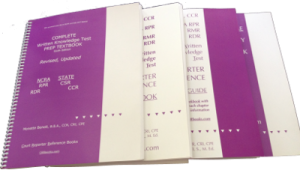 A journey through the RPR, CSR, RDR Written Knowledge Test Court Reporter Reference Workbook is a journey through all these components, and all one has to do is answer the questions. By the way, Monette, I was the guy who came up with the two greater than signs (>>) for change of speaker in roll-up captioning. A certain unnamed friend wanted to use two at signs (@@) because he thought it looked like two ears. I passed the NCRA Written Knowledge Test with a 97! I am so proud and relieved by accomplishing one hurdle in the midst of my patient prodding. Thank you for the NCRA written exam, WKT books, which I found on Court Reporter Reference Books, www.crrbooks.com to prepare students and court reporters for this hurdle. 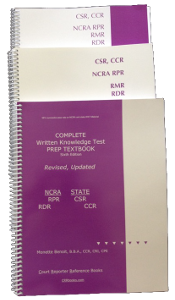 The NCRA WKT materials from CRR Books & CDs were a great help in passing the test. NCRA posted the WKT results and I passed! I purchased the CRRT (Court Reporter Reference Tutorial) CD version and found it to be very easy to sit down and study for a few minutes or longer when I had time. The content was challenging and provided me the direction I needed to focus on the areas I still needed to study. I find your energy, Monette, to be great! Your enthusiasm is wonderful. You are a delightful teacher and author. Before I began to work with you, I was always able to find something about life that interrupted my goals. Thank you for believing in my skills and dedication to this goal of becoming a certified court reporter. I needed that to pursue my goals. Your specific homework assignments and reviews – customized – to where I am and what my skills need to be have benefited me greatly. And I passed another test! It was refreshing to pass one test, then another and to give me that feeling that you talked about. I have greatly appreciated the opportunity to fully review your fine book, CSR, RPR, RDR Written Knowledge Test Court Reporters Reference Textbook, which is aimed at assisting students to pass the written knowledge test given in conjunction with the NCRA RPR test and CSR state tests. Bravo! Bravo! What else can I say except that you have done a tremendous job. What a job it must have been researching all that material. You must have spent an enormous amount of time putting together the CSR, RPR, RMR Written Knowledge Test Textbook and Workbook. I am sure that the students who use your books to prepare for the WKT, written exam, must sing your praises. I have found the CATapult BEEDs CD to be an incredible practice tool. It is not only a fun way to practice, but it reminds me what I NEED to be practicing. There are so many great exercises already there, and then I have the added benefit of personalizing it by creating a new practice of anything I’m having specific problems with. It gives me something to look forward to when I sit down with my steno machine. I enjoy the times when I can sit down and give my BEEDs CD a good work out (or the other way around!). Then there are also times when I only have a few minutes between or before a class. I have found that taking advantage of BEEDs CD during those short minutes can really make a difference in my writing during class. Thanks, Monette! This is terrific. Thank you, thank you, thank you! I have already pasted them (free custom CATapult drills) in, and they’re working well! Great! The CATapult Medical CD is pretty cool! And I really enjoy the feature where you can make your own individualized lists. I am a working reporter who has lived in NJ, but worked in NYC since 1989. I take a fair amount of medicals and hard stuff and always try to shorten my writing to make it as brief as possible. I have been working on that for the last five years or so and have noticed a great improvement in my speed and accuracy. Your CATapult CD program, I think, will help me drill, as well as pick through my own transcripts for common words and phrases that occur in the work I do. New briefs are difficult to learn on the job, but I guess we all do it, right? I have changed some basic, fundamental ones to make them more efficient and avoid a conflict or two over the years. It certainly sounds like you are on the cutting edge of this field. And thank you for helping so much! This is a very difficult profession, and I say that even now after so many years! I do try to improve my skills, abilities when I can. I have learned the more accurate and efficient I am, basically the easier my own jobs are going to be. And that, for me, is incentive enough… I am just a normal guy working for a living. I did an Internet search and came across your site www.CRRbooks.com. Now I have got it bookmarked. CATapult BEEDs CD is an excellent program. In fact, my daily regimen after reading court reporter-related Yahoo! groups is to open BEEDs and start practicing. Then I play something, like the Bible, in Windows Media player. With BEEDs, I am aiming at accuracy. With Windows Media player, my goal is speedbuilding. Sometimes, when I am multitasking or need to take a break, I just watch the BEEDs CD flash and dictate my study material (which I have copied and paste) in large font, 48 or 72, sit afar (or do other activities) and watch as the BEEDs CD flashes phrase after phrase, word after word. Hi, Monette! I am very proud to say that I have completed court reporting school and have started working. I have only taken three jobs, but have discovered that I now have something completely new to process. You are among the people who gave me an extra push when I needed it. After reading your words about processing, I never looked at school the same way. Of course, I was frustrated many, many times; however, I never felt as if I was standing still. I was always able to see a pay-off from my efforts; even if it just meant that I could sit and write for three hours without stopping, instead of only two and a half. Thank you so much for taking the time to encourage me and offer support. I really love the CATapult BEEDs CD, and I am glad that I purchased it. It has been so helpful, and will continue to be, I am sure. But I am most grateful that you took the time to go beyond answering my questions about your product. You took the time to address the root of my problem, which turned out to be a problem of perception and mindset. You have three choices of how you want the drills to come across: Flash, Jumble, or Dictated. In addition, it comes programmed with an abundance of already established finger drills, numbers, street addresses, etc. I love my CATapult BEEDs software. At present, I am practicing phrase briefs and families of briefs (I cannot, you cannot, etc. ; do you think that, do you recall that, do you remember that, etc.). I am chugging away, and I really love the randomization capability. It is one thing to have a list of briefs and phrases on a piece of paper or on a page in a book, but when the phrase comes flashing at you at your present rate, totally randomized, it is much more realistic. I have old software, but it does not allow one to input your own briefs, words, phrases. It does not do what BEEDs does. I think the CD is great. I will be working on thousands of briefs. I think the program will be invaluable to me. I have started entering the thousands of briefs that I will be incorporating. I will let you know the success or improved ability over my current practice sessions. With the CATapult CD series I think globaling is a major plus. With another software, you end up with auto entries in your dictionary that you oftentimes do not want there, so you have to backtrack and delete. I would much rather give it a few seconds, analyze the steno and the entry, and then decide whether or not to add it. I am, of course, interested in improving myself, as a senior court reporter; I find it increasing difficult to write at the speed I used to have (I’m an RMR). Therefore, when I come across CATapult CDs, a product such as yours, one that will enhance me professionally and help build my dictionary, I try it. If I enjoy the product, and it works as claimed — of course, yours does — I try to pass it on to my fellow reporters. I can say I am a certified operator of CATapult BEEDs and CATapult CDs, and a pretty darn good test-taker of legal terms from the ** written knowledge test, WKT CRRT CD for test preparation. You have a good model for drills, and it is well-executed. I loved the ability to personalize it with fonts and sizes, and even with content! “You have to picture me with active children — each day. I’m always happy to give a testimonial about your products because they are all good. All my students, from way back, loved the dictation material “Popcorn Q & A” and the books: WKT CSR, RPR, RDR Text, Workbook and Study Guides. Your Handbooks are great! And the Sports ‘CATapult Your Dictionary; CD is fun to work on. When I started using the CATapult BEEDs CD I was smiling – as compared to another product — because it does so much more because I am practicing words I want to practice, not what others want me to write. I am able to adjust the practice modes, to enter words, to refine my skills. I can change the speed in the BEEDs CD, and it is so great! I have the hang now, and I am very excited about this CD software program now. Plus with your tutoring I am not bogged down, and I realize this is not far out of reach. I can do this! BEEDs has given me results I can see. The more I see results the better I feel, and that is a real plus for me! It is a really very helpful CD for students and court reporters. I am now able to put in what I want and what I want to clean. When I look at my dictionary and my errors, now I stick the word in BEEDs. My fingers are getting stronger writing all the words more accurately. I feel so good about what I am doing, and my accuracy is going up. No one has ever taught me this before. I am very excited. I am achieving what I wanted to achieve. I used to sit and practice; I was not paying attention. It was not taking me anywhere. I was going to school and not putting in as much as I should have. My journey into court reporting began many moons ago. I attended school for a short while. During that time, I suffered a tremendous loss in my life and dropped out. My entire world collapsed. I returned to school years later, but was not able to complete the program. As time went by, I had many jobs always thinking of how challenging ’that little machine’ was and the impact it had made in my life. I continued to read anything and everything pertaining to court reporting, including the JCR magazine. I maintained relationships with working reporters. Fast forward to January 2007, while reading the JCR magazine, I saw a classified ad, which offered court reporting tutoring. I immediately recognized the name as I have been reading Ms. Monette Benoit’s articles for years. I emailed Ms. Monette. She returned my email, and then we spoke on the telephone. My life, once again, changed. We had an “intake” — more like a heart-to-heart conversation about my dreams and goals. Her energy and support were unbelievable. I felt like an angel had just walked into my life to guide me, and I wholeheartedly believe God places people in our lives at just the right time. This was only the beginning… I shared with Monette not just my court reporting frustrations, but many other things. Monette listened and advised. We established what I am certain will be a lifelong relationship. Tutoring is such a small part of how Monette has reached me. Because of Monette, I have made new friends in the court reporting profession. I have emailed people for assistance and received all positive responses. My new friends (and I am sure there will be many, many, more) spent hours on the telephone with me. One in particular found Ms. Monette in the same little ad and also refers to her as an angel. They, like Monette, share their court reporting and life experiences, which enthrall me. I love to listen to them. It is enlightening and funny as all heck. They are real people with real stories and invaluable advice. They are true professionals. Thank you, Monette. DIO = OTO. Done In One = Only Test Once.